Mark your calendars, Peninsula soccer fans! The schedule for Lionsbridge FC's inaugural season is set. The Premier Development League, the top amateur men's soccer league in North America, announced the league-wide 2018 schedule on Thursday. Lionsbridge FC opens the season on the road before making its POMOCO Stadium debut with multiple home games on Wednesday, May 16 (Evergreen FC) and Saturday, May 26 (Myrtle Beach Mutiny). Lionsbridge FC will have a chance to capture a rivalry trophy early in the season. 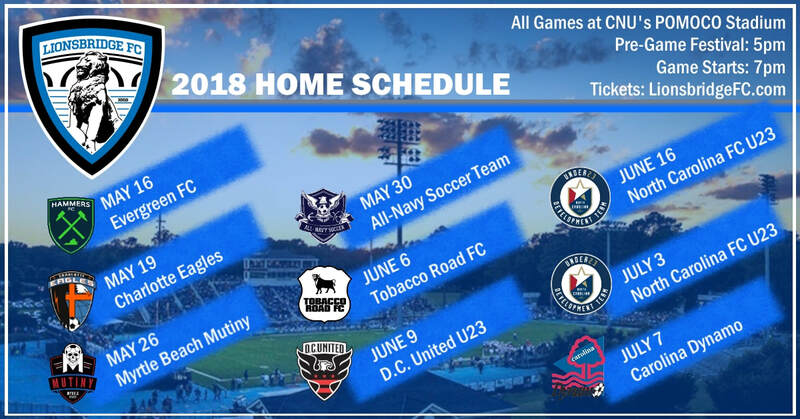 Lionsbridge and Leesburg-based Evergreen FC, the only PDL teams in Virginia, will compete for the Commonwealth Cup in a two-match format on May 5 (away) and May 16 (home). Lionsbridge FC will compete in the highly competitive South Atlantic Division of the PDL. Last year, the division included the eventual PDL national champions (Charlotte), a combined 117 NCAA Division I players, the 2017 NCAA Player of the Year and 5 players who were selected in last month's MLS Draft. "As a competitor, you always want to take on the best competition and see where you stack up. The level of play in PDL is tremendous and the bar in our division has been set super high. We can't wait for the opening whistle," Lionsbridge chairman and co-founder Mike Vest said. The festivities before every home Lionsbridge FC match at POMOCO Stadium begin at 5pm. The two-hour pre-game community festival will feature craft beer from Tradition Brewing Company, food truck vendors, music, bounce houses and other fun, family activities. The soccer games begin at 7pm. Select games will feature post-game fireworks. Season ticket wristbands are now available for purchase at LionsbridgeFC.com. Group tickets (20 or more) may be purchased by calling 757-656-9659.